Nothing gives your railroad a human touch like, er, people. Little people, waiting on trains, looking in store windows, or relaxing on their front porches. And nothing says "human habitation" like "stuff." This page will link to other pages that discuss people and details that will bring your trains and communities to life. Garden Railroaders are People Who Need People - For years before I had a permanent outdoor railroad, our family would set up a Large Scale train and little village around the Christmas tree each December. I had a box full of people, animals, street signs, fire hydrants, fences, and the like that I would use to populate the town. Then when I got my first loop of track installed outside, I moved the same town there, and set out all the same accessories. So far so good (except when the raccoons would wander off with something). But then I finished the "other half" of my railroad with its little towns as well, and spread what had seemed like a ridiculous amount of figures and accessories through all of the "communities." Suddenly my previously "busy metropolis" looked like a ghost town. When I tried to take photos, I found myself "borrowing" people and stuff from one scene to use on the next to keep every setting from looking virtually abandoned. So I started looking to accumulate more figures and other details on a relatively restricted budget. I also started examining how other people used figures and other details and accessories on their railroad. From examples like Wil Davis' Buckeye Falls (now in mothballs but hopefully reviving next year) I learned that the right figures, effectively used, lend a sense of proportion and purpose to your railroad that nothing else can. "Stuff" Doesn't Just Happen - When you add the "clutter," that is, the stuff that those figures are ostensibly making, using and discarding, your railroads and communities take on new life. In addition, many, if not most, of your non-railfan visitors, once they've seen the trains come past a few times, will pay more attention to the communities and the people who inhabit them than they will to the trains. Though it many sound sacrilegious to some, your choice and use of figures and other details could be just as important to some visitors as your choice and use of trains. Most people have never spent time around real trains, but people have been around "stuff" their whole lives. 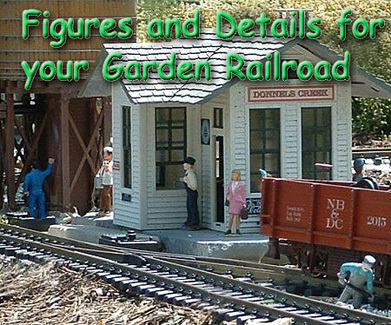 Choosing Figures for Your Garden Railroad - A description of your choices and why "one size" doesn't necessarily "fit all." More about Scrounging Figures - Some new off-the-wall sources for Large Scale I discovered in early 2009. Even if they disappear soon (which they might), they'll give you some ideas for other places to look. Using Christmas Village Figures and Accessories on Garden Railroads - This is our first article on the subject, and it still describes the choices you face when using these figures in more detail than any other article on the subject I've seen. Other articles will deal with signs, accessories, and other subjects as time permits. I also hope to provide links to articles on other folks' sites - the articles have to be original, access to the articles has to be free, and the people running the sites have to give me permission. So if you have come across an article that deals with the topics on this page, contact me, and I'll check it out. Right now I have one link, from a very creative scrounger in Australia. Using clothing "snaps" from a fabric store to make cast wheels, the sort of thing you might see on any kind of steam-powered device, or on pipe lines, as brake wheels, faucet handles, shut-off valves, etc. Phil has also glued two back-to-back to make a pulley. Using flat shoe-string to represent collapsed firehose. Using wet-and-dry sandpaper as roofing. Anyone else have any tips or links they'd like to share in this space?